Before I could start on the Horiz. Stab front spar, I had to get a band saw. And, I noticed Van’s also recommends a drill press in this section as well. So, ….its off to Home Depot I go. Was gonna get Craftsman. But, when I went to Sears to see what they had, their tools looked an awful lot like the Skill brand with just a name change. I liked the finish and overall appearance of the Ryobi tools better, and they were each about $10 cheaper than what I saw at Sears. 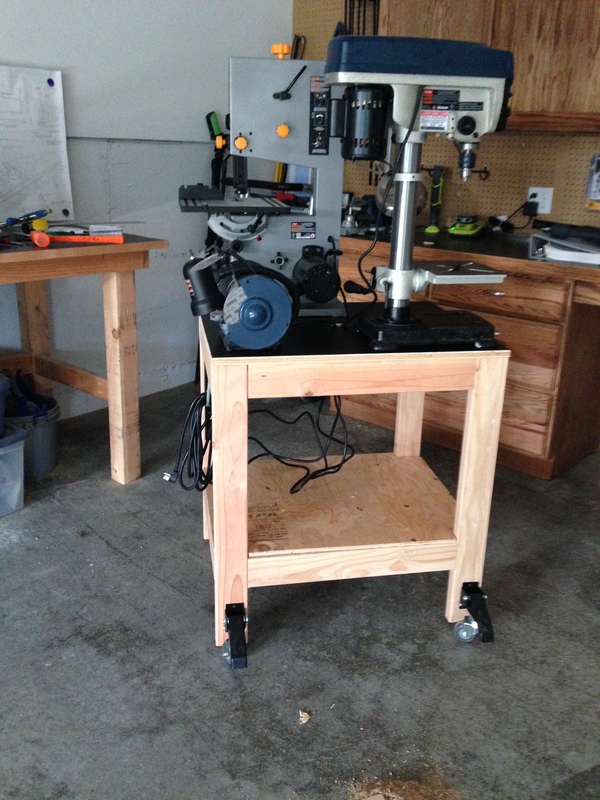 I made a small work table with wheels that raise and lower to mount them on, along with the bench grinder. Can’t claim credit for the idea. I’ve seen other builders that have very similar setups. This entry was posted in Shop & Tools. Bookmark the permalink.